No matter your age or skill level, there are many options for taking an art class in Wichita. Here are a few places where you can discover a newfound artistic talent or further develop an area of interest. CityArts: More than 35 professional artists teach an array of topics, including digital arts, photography, fiber, silversmithing, glass fusing, glass blowing, painting, pottery and drawing. 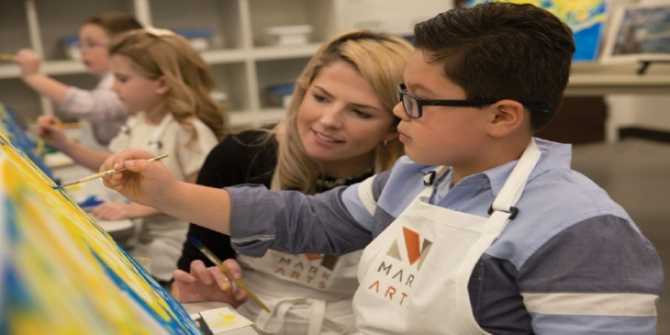 Mark Arts: Find classes and workshops in nine art studios, including digital arts, drawing, enameling, jewelry, metalsmithing, painting, photography, printmaking, pottery and sculpture. Tessera Fine Art Gallery: This art gallery is also home to artist&apos;s studios and a classroom where you can take classes and workshops from local artists. Learn about mixed media products, tools and techniques or take a class on journal making, lettering, watercoloring and more. Mid-America All-Indian Center: Take classes taught by local American Indians in clay sculpture, dream catchers, loom making and jewelry design. Wichita Art Museum: They offer seasonal classes and lessons for youth as well as hands-on artmaking projects as part of its free Family ArtVenture every fourth Saturday of the month. Pinot’s Palette and Paint the Towne: Sign up for a guided painting experience; all-age sessions available as well as adult sessions. The Art Park: This enrichment campus is home to several programs, including Monart School of Art. They offer a range of classes and activities for the whole family. Love of Character: A party supply and gift shop that often throws its own parties as well as occasional classes and workshops, from brush lettering and watercolor to printmaking. The Busted Pallet: This rustic wood sign studio has the city’s only paint splatter room and offers workshops where you can make your own framed sign, lazy Susan, door hangar or centerpiece box. Wichita Pottery: A teaching studio that offers classes in wheel throwing, hand building and sculpture for adults and children.